He was born in Bologna, and in all likelihood was first apprenticed within his family. 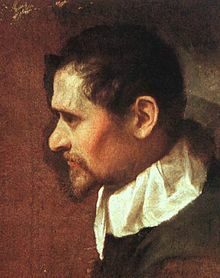 In 1582, Annibale, his brother Agostino and his cousin Ludovico Carracci opened a painters' studio, initially called by some the Academy of the Desiderosi (desirous of fame and learning) and subsequently the Incamminati (progressives; literally "of those opening a new way"). While the Carraccis laid emphasis on the typically Florentine linear draftsmanship, as exemplified by Raphael and Andrea del Sarto, their interest in the glimmering colours and mistier edges of objects derived from the Venetian painters, notably the works of Venetian oil painter Titian, which Annibale and Agostino studied during their travels around Italy in 1580-81 at the behest of the elder Caracci Lodovico. This eclecticism was to become the defining trait of the artists of the Baroque Emilian or Bolognese School. In many early Bolognese works by the Carraccis, it is difficult to distinguish the individual contributions made by each. For example, the frescoes on the story of Jason for Palazzo Fava in Bologna (c. 1583-84) are signed Carracci, which suggests that they all contributed. In 1585, Annibale completed an altarpiece of the Baptism of Christ for the church of San Gregorio in Bologna. In 1587, he painted the Assumption for the church of San Rocco in Reggio Emilia. In 1587-88, Annibale is known to have had travelled to Parma and then Venice, where he joined his brother Agostino. From 1589 to 1592, the three Carraccis completed the frescoes on the Founding of Rome for Palazzo Magnani in Bologna. By 1593, Annibale had completed an altarpiece, Virgin on the throne with St John and St Catherine, in collaboration with Lucio Massari. His Resurrection of Christ also dates from 1593. In 1592, he painted an Assumption for the Bonasoni chapel in San Francesco. During 1593-94, all three Carraccis were working on frescoes in Palazzo Sampieri in Bologna.